Multilingual education has radical lessons to teach all oppressed learning communities. Working in the elementary school at which I am currently stationed has caused me to think a great deal about the politics of language in education. In the sixth grade with which I spend most of my time, there is a solid community of students who speak little or no English, and an even larger circle whose parents and relatives are not native English speakers. As a limited Spanish speaker, I have been called upon on multiple occasions to translate particular lessons for students who are having trouble following along in a language which is unfamiliar and difficult to understand. I have also translated during open houses and parent-teacher conferences for the Spanish-speaking families of kids from across school grades. In these various instances, I have been surprised to find how much support there is for bilingual learning in the building and amongst the staff. 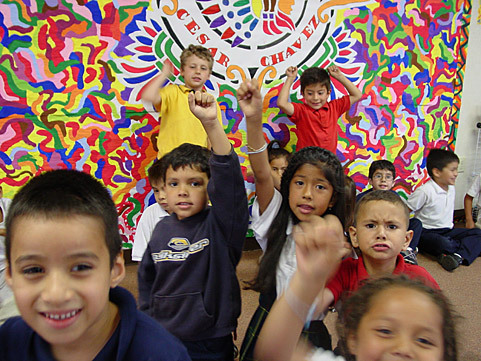 Though there are only a few classrooms with bilingual curricula and led by bilingual teachers, there are a wide collective of support staff and professionals who work with individual and small groups of students, teaching particular skills in the kids’ own languages–including Spanish, Portuguese and Khmer–and helping them to master English. In multiple interactions I have had with families and parents I have conveyed the message expressed on the part of educators at the school that all language practice is crucial to support the mental growth of students. Guardians are vehemently encouraged to read to their children in whatever language they are most comfortable, to speak actively to kids in their mother tongues, and to work at maintaining the family’s original language(s) while also attempting to practice and familiarize English. This complicated messaged, delivered from the representatives of a state-sanctioned institution, brings up some crucial questions around what multilingual learning has to teach us about radical visions for public education at large. Richard Rodriguez, a queer Chicano writer and educator who receives much attention for his usually politically conservative stances, never the less writes movingly about his experiences as a first generation U.S. citizen and student in his memoir Hunger of Memory. A “scholarship boy” attending private Catholic schools as a young student in California, Rodriguez was banned from speaking Spanish in his educational environment, and suffered all manner of alienation and spite as one of an infinitesimally small number of Mexican students. As he began to excel in his studies, receiving a great deal of attention and extra support from his enamored educators, an awareness grew in him that his intellectual indoctrination was in dissonance with his family and home life, as did a sense that his academic success was dependent on distancing himself from his culture and heritage. The hatred which he began to feel for his family and neighborhood, the shame in his parents’ poor English, the shabbiness he began to perceive in his own house, was rooted not only in his education’s denigration of his race, but of his class, his history and his immigrant heritage. Rodriguez actually comes out against bilingual learning in the same section of Hunger of Memory, ultimately stating that the goal of education is precisely to inculcate citizenry with the expectations of the social structure in which that education locates itself. U.S. schooling is about manufacturing proper U.S. citizens, and this could not be done, Rodriguez argues, while maintaining his Mexican heritage. According to him, bilingual education is hypocritical because it seeks to preserve students’ cultural heritages even as it indoctrinates them into a system designed to destroy those heritages. While I want to challenge Rodriguez’ conclusions, I think he makes some very astute and important points. Where I agree with Rodriguez is that education–both public and private–is a key component of the state apparatus, and exists at its foundation to prepare its students to become compliant participants within that apparatus. This is the nature of the public education system, and a fact that we as public educators cannot get around. Where I disagree with Rodriguez is in his sense of reservation, that this is what education must inevitably be about. What multilingual learning represents to me is not a failed or naive attempted to preserve culture in a culture-crushing institution, but rather the breaking down of the very goals and means of that institution. Every time we answer a question in more than one language, allow students to speak with one another in their own dialects at lunch, or work to explain a new concept in multiple ways, from multiple perspectives, we are undermining the goals of the state apparatus. What multilingual education reminds us, I believe, is that the educational system of which we are a part was not originally designed to support, maintain and nurture the histories and traditions of those who are quickly becoming its majority. Multilingual learning forces us to acknowledge the complexities of our learning communities, to question our own assumptions about the goals of education, and to challenge ourselves to engage in just as much of a process of learning as our students. It demands heightened cooperation from all members of the learning community, and asks us to continually renew our commitment to a full-scale restructuring of public education. These messages extend beyond multilingual and immigrant communities, teaching all oppressed people what a radical education–one designed to acknowledge and empower their existence–might potentially look like. Where I also agree with Rodriguez is that believing that by teaching a class in English and Spanish, or by having a week-long unit on Cambodian history, we have done our part in creating an inclusive education is delusional. Multilingual learning additionally forces the realization that education as an indoctrinating limb of the state apparatus requires fundamental structural reworking before it can become truly democratic in its vision and capacity. A revolution in learning does not happen simply by putting up multilingual posters, or introducing a few new topics for class discussion. It happens when the classroom and its curriculum are entirely reimagined with the help of the whole community, in an effort to radically shift the power dynamics therein.